Fourth Row Center: Film Writings by Jason Bailey: On DVD: "Rango"
Gore Verbinski’s Rango is an absolute and unexpected charmer of a movie, a clever and sophisticated movie-savvy comedy that happens to be animated. From the strains of the spaghetti Western overture onward (the music is by Hans Zimmer), director Gore Verbinski fills his picture with little winks to the grown-ups in the audience; yes, it may feature Johnny Depp as a cartoon lizard, but its plot is a riff on Chinatown, it builds a key set piece as an homage to Apocalypse Now, and the titular character’s desert adventure is interrupted by a quick encounter with one of Depp’s previous characters—Raoul Duke from Fear and Loathing in Las Vegas. Not too many family films feature a cameo appearance by Hunter S. Thompson’s alter ego. But describing the film in these terms is tricky, since the Shrek movies and their ilk have made us all a bit less intrigued by the notion of pop culture-quoting cartoon comedy. So it is worth noting that Rango isn’t content with mere quotation—it isn’t lazy like that. Instead, it gives itself the luxury of accommodating the dream world alongside those pictures, and having fun living there; in spite of the movie’s breakneck pace, the jokes aren’t pushed. Much of that is due to Depp’s slightly sprung comic timing—his delivery is laconic, sometimes throwing away his punchlines the way he did when he played Duke or Sands in Once Upon a Time in Mexico. It’s a high-spirited vocal performance, but not in any expected way; Depp is confident enough to lay back a little and play every bit in the proper key. 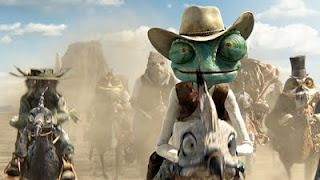 In the early scenes, Verbinski doesn’t seem to have much of an interest in exposition; he leaps right in to the adventure, with a series of chases and pursuits, before finally settling into the main story, which finds Depp’s Rango, tossed out of a moving car (and his terrarium), crossing the desert and settling in the town of Dirt, which is filled with rodents, reptiles, and creatures of all types. It’s a proto-Western set-up, with Rango shooting off his mouth and bluffing his way into wearing a sheriff’s badge. But the town of Dirt is in the midst of a paralyzing drought, and there are whispers that their water is being dumped in the desert for reasons unknown. The screenplay is penned not by a kiddie-movie specialist, but by John Logan, whose credits include Any Given Sunday, Gladiator, and The Aviator; I’m not sure if he’s a father, but it plays like the work of a man who is very tired of sitting through dumbed-down kids movies. Much of the film is pitched as a comedy, but it has strange little detours, like the town’s surrealistic slow-motion line dance at high noon or the evocative little sequence of Rango’s fall before the inevitable third-act triumph. That scene culminates with an appearance by the laconic “Spirit of the West”; the only thing more surprising than who you think voices it is who it actually turns out to be. (Suffice it to say, he could pursue a lucrative side living as an impersonator.) But that stretch takes a surprisingly poignant turn, and Rango’s romance with Beans (voiced by Isla Fisher) is sweet as well. And the action sequences are genuinely exciting—they’ve got a swashbuckling spirit, which isn’t surprising, considering that Verbinski is best known for the Pirates of the Caribbean pictures. Like those films, Rango is unfortunately overlong, which takes some of the mirth out of its rather protracted climaxes and payoffs; you feel it running out of gas long before the filmmakers apparently did. But even if it doesn’t finish strong, there’s still much to recommend here—it’s a light, enjoyable entertainment, funny and quirky and quite a bit smarter than it probably had to be. 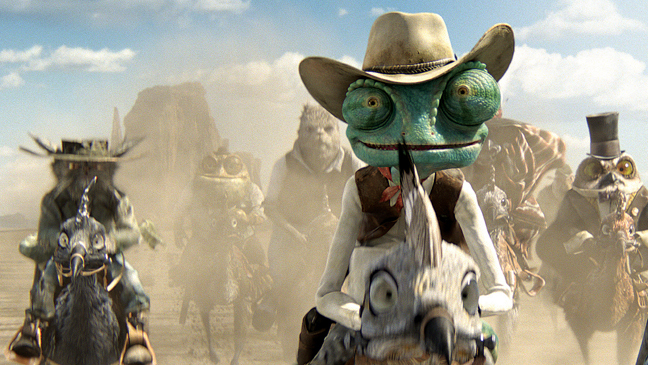 "Rango" debuts today on DVD and Blu-ray.